How did you become part of IYM and for how long have you been part of IYM? I joined indigo cause I saw the program they run in my community and the positive impact they have brought on other skaters and youth that’s part of their program. I’ve been with indigo for 4 years. Tell us a more about why you decided to join the IYM skateboarding instruction team? Through being a skate instructor (coach) I can show the youth that through skateboarding you can rise up out of your circumstances. It also allows me to do what I love and at the same time give back to my community. Describe how you been a leader or displayed leadership skills or abilities? I’ve showed youth how to live a positive and healthy life style and be a role model within skateboarding and their communities. I’m also an IYM youth ambassador along side Enwin Galant. We were chosen to be on this team as we were being positive role models in the project and trough our achievements in winning skate competitions and waving the IYM flag wherever we go. Through that IYM sponsored me product which helped me progress and get more sponsorship’s on my own. Have you picked up any other sponsorships? Yes. I am sponsored by Technique Skateboards, Certified Hustler clothing and Luke Jackson at Converse flows me shoes. Yes. I look up to a lot of skateboarders, but the ones who really inspires me in what I’m currently busy with is, Dallas Oberholzer; for everything he has done for skateboarding and how successful he became with lots of hard work and Charl Jensel for what his doing in his community, and how his worked his way up in indigo youth movement. I want to work my way up to become a manager in indigo youth movement, become a pro skater, get legit sponsors that will be able to help me achieve more goals like travelling the world and grow skateboarding in rural countries. Whats it like working in Valhalla? Tell us more about the community. So far it’s a great experience, working with kids isn’t easy but it’s a blessing having to doing what I love and shearing what I love with others, through skateboarding there’s endless possibilities. The community of Valhalla has excepted us being there, kids has changed in a good way now that there is something exciting and different in the community, and at first people will think skating is just something that is a toy but now they see how skateboarding can bring peace, people together, take you places.. And most importantly keep people busy instead of walking around in the wrong crowed not knowing where you belong in this world, youth doing drugs, cause skating teaches you so many things, disappline, how to be humble and patient, working hard, when you get knocked down you should get up.. So far I’m loving Valhalla. Do you think these programs will make a change? Why? Yes it has already made change. Why? Because kids loves indigo, they can’t wait for program to start.. They will be there hours before the time, it brings joy, happiness, excitement and wanting to learn new things, there’s not as much violence anymore or people coming to cause harm at the park or to skaters in the community. 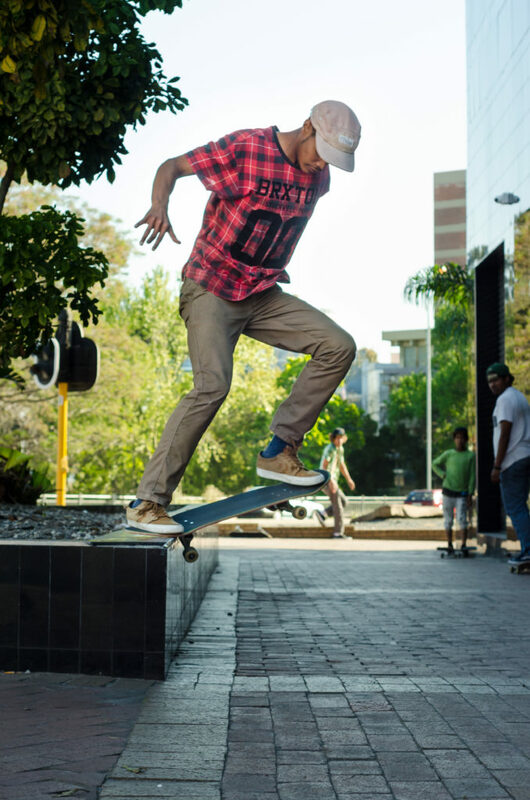 How do you think skateboarding helps you or any one that skates in everyday life? Skateboarding helps me stay fit, when you a skateboarder you wanna be good at it, you wanna learn new tricks, so in order to do that for a long time you have to eat healthy, exercise and skate every day. So it keeps me busy too. Instead of sitting around, I’m up being productive, skating either parking lots and skate parks. Skateboarding has really expose me to things I never dreamed off. That’s what keep me glued – the endless adventures and the loyal community of friends that look out for one another. Any words of inspiration you want to share with the readers? I don’t have much to say, but for starters, what I’ve learned is that you can’t expect big things by doing nothing; you got to put yourself out there and work hard, and live a healthy lifestyle, so that you can keep on doing what you love for a very long time, like skateboarding or any other sports.